Rabbi Yonason Johnson serves as the dean of Kollel Menachem and the Director of Adult Education of the Yeshivah Centre in Melbourne. Having studied in Yeshivos in Israel and Australia, Rabbi Johnson has been a Torah teacher and lecturer in Adult Education for over 15 years. He has received Semicha from Machon Chaim of Melbourne and Shimmush from notable halachic authorities in the USA, specifically Rabbi Gavriel Zinner of Boro Park - author of the Nitai Gavriel series of halachic works. He is a gifted orator who has the ability of expressing deep concepts in simple language and imparting to his audiences a thought-provoking and uplifting message. His lectures attract large crowds from the spectrum of the Melbourne Jewish community. Rabbi Johnson specialises in weaving a kaleidoscope of Torah sources; Midrash, Gemora, Chumash with meforshim, Kabbalah and Chassidus to develop ideas and explore their depth. His vast knowledge, engaging delivery and use of PowerPoint visual presentations come together to create a stimulating learning experience. From 2004-2006, Rabbi Johnson was a full-time teacher/lecturer for Bina, a Sydney-based Adult Torah Education organisation. 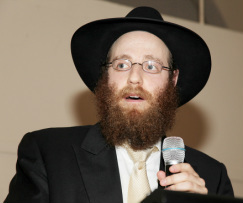 He then spent 5 years in Crown Heights (2006-2011) running the Manhattan Kollel. While in N.Y., Rabbi Johnson was a highly sought-after speaker, presenting for Nshei Chabad, Shluchim and teacher development seminars in local schools. He also taught regularly for the Beis Medrash Lenoshim, delivering a weekly Shabbos shiur which attracted over 100 participants. If you are interested in hosting a lecture for your community or to contact Rabbi Johnson, please click here. All I Ask of You, What should be the focus of our High Holiday prayers?